In 1883, the Tahquamenon River Improvement Company completed the removal of 16,000 cubic yards of sandstone, including a small waterfall from the bed of the river. The $41,000 project was done to make the river suitable for navigation, ready the river for log drives, and deepen the river to drain thirty square miles of swampland owned by the company. James McMillan (shown on the left of plaque) and John S. Newberry (right) founded the Detroit, Mackinac & Marquette Railroad (DM&M). After completing the railroad, the company sought ways to develop the properties that they owned along the route. 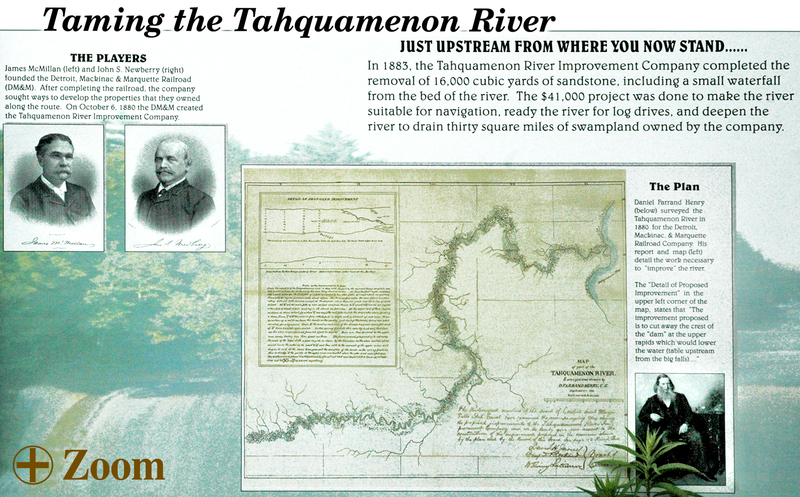 On October 6th, 1880 the DM&M created the Tahquamenon River Improvement Company. Daniel Farand Henry (far right on plaque) surveyed the Tahquamenon River in 1880 for the Detroit, Mackinac & Marquette Railroad Company. His report and map (shown on right) detail the work necessary to "improve" the river. Please click onto the +Zoom section to view larger image. This informational plaque is located along the trail to the Upper Tahquamenon Falls.